DAYTONA BEACH, Fla. – In his debut appearance at the World Center of Racing, Harrison Burton joined father Jeff and uncle Ward as a winner at Daytona Int’l Speedway by topping Saturday night’s Lucas Oil 200. The 18-year-old Burton assumed the lead after a lightning-fast pit stop under caution just past the halfway point, then held off challenges from both Christian Eckes and Todd Gilliland in the waning laps en route to his third-career ARCA Menards Series victory. Burton led the final 43 laps uninterrupted, in a race that was extended from 80 laps to 86 laps due to an overtime finish, and was understandably emotional upon climbing out in Gatorade Victory Lane. “Wow, this is amazing,” Burton said. “I lost my voice after the checkered flag because I was screaming and yelling for a long time. This is so cool, man. I don’t even know where this ranks in my life right now; it’s crazy. I can’t even put into words how much this means to me and to the people who have supported me through this entire journey. 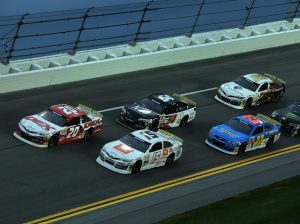 Though Burton led the most laps – a whopping 48 in total – he had to weather two restarts inside the final 10 laps before he could celebrate a win at Daytona. The first was set up after a flat right-rear tire on Thad Moffitt’s car sent him spinning in turn four, with Derrick Lancaster, Jason White and Bobby Gerhart also collected in the ensuing chaos. When the green flag waved with four to go, Burton and Eckes orchestrated their plan to perfection, with Burton slotting in ahead of Eckes and the pair attempting to scoot away from the rest of the pack. 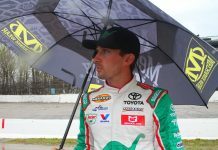 However, further back, Brandon McReynolds and Todd Gilliland got hooked up in tandem and mowed through the field rapidly in an attempt to challenge for the victory in the closing moments of the race. That duo got inside the top five by the two to go signal, but going down the backstretch Gilliland got into the back of McReynolds and ultimately hooked the No. 28 into the outside wall, sparking another late crash and drawing the fifth and final caution flag of the season-opening event. With a new overtime procedure in effect, Burton and Eckes lined up side-by-side for a one-lap dash to decide the victor, with Gilliland and Natalie Decker right behind on row two. Gilliland gave Burton a huge push on the race-deciding restart, getting the two out front to settle things between one another. Though Gilliland tried and tried down the backstretch and in turn four on the final lap, he didn’t have enough steam in his No. 4 Frontline Enterprises/DGR-Crosley Toyota to challenge in the end. “I thought I had him there; I honestly don’t know what more I needed,” admitted Gilliland. “Being the pusher, I thought we could clear the outside lane and then I could slingshot around him, but I just couldn’t. I was wide-open the entire way around. This was an amazing race car and I could go wherever I wanted, but there was just nothing more I could do. Twenty-one-year-old Canadian Grant Quinlan finished a career-best third in his second Daytona start for Rette-Jones Racing, followed by Eckes and Sean Corr. Natalie Decker, Codie Rohrbaugh, Travis Braden, Andy Seuss and Riley Herbst completed the top 10. Defending race winner and pre-race favorite Michael Self was eliminated from contention in a lap-three crash, after contact from Willie Mullins sent his No. 25 Sinclair Oil Corp. Toyota spinning into the grass. Self was able to make repairs and return, but finished a disappointing 31st. Harrison Burton, Todd Gilliland, Grant Quinlan, Christian Eckes, Sean Corr, Natalie Decker, Codie Rohrbaugh, Travis Braden, Andy Seuss, Riley Herbst, Connor Hall, Tyler Dippel, Bobby Gerhart, Chuck Hiers, Leilani Munter, Jason White, Derrick Lancaster, Bret Holmes, Brad Smith, Dave Mader III, Joe Graf Jr., Con Nicolopoulos, Tommy Vigh Jr., CJ McLaughlin, Brandon McReynolds, Gus Dean, Thad Moffitt, J.J. Pack, Brenden Queen, Paul Williamson, Michael Self, Scott Melton, Eric Caudell, John Ferrier, Willie Mullins. Lap Leader(s): Eckes 1-9, Burton 10-13, Dean 14, Burton 15, Dean 16-43, Burton 44-86.